Where Math Meets Art Xinxian Wang '21 was able to marry two interests in an internship with The Visual Arts Center in Richmond. Xinxian Wang ’21 poses in historic Jamestown with her summer host, Mark Cannon, whose daughter also interned at VisArts. What is the Visual Arts Center in Richmond, and what does it offer the community? Founded in 1963 as the Hand Workshop, The Visual Arts Center of Richmond (VisArts) is a nonprofit community arts center that offers more than 800 visual and creative arts classes each year. Each year, the organization serves more than 40,000 people through its classes, exhibitions, community outreach programs, camps, workshops and special events. What W&L courses and prior experience made you a good fit for this internship? VisArts was looking for students with experience in mathematics and an interest in art because they wanted someone who could analyze the organization’s data and make recommendations to improve their scheduling. At W&L, I have taken several math major requirements as well as INTR courses. These courses offered me necessary analytical skills and approaches to data optimization. What’s more, as a studio art minor, I’ve always had a passion for art and had previous experience working in the studio setting at the Lenfest Center. Therefore, I am also able to help with art exhibition setups at VisArts. 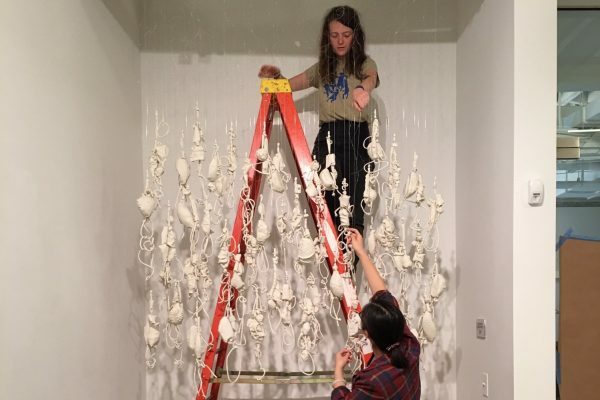 Xinxian Wang helps set up an exhibit at VisArts. What projects have you been working on for VisArts this summer? For the first half of the summer, W&L mathematics professor Kevin Beanland taught me how to solve scheduling problems using a software called GLPK. Then, with his assistance and the cooperation of VisArts’ education team, I worked on two projects: analyzing VisArts’ wait lists and canceled courses, paying special attention to all age groups during the past year, and comparing adult and youth course feedback in order to make recommendations to optimize the center’s course schedule and studio arrangements. What will be the final product of your work? The final product will be a report and presentation to the staff as well as the fulfillment of the requirements of a CPD 451 internship for credit. What are the greatest lessons you have learned at VisArts? Be ready to make mistakes and never be afraid of asking questions. It was a little bit scary at first. I was facing 1000+ data points and had zero background knowledge on how VisArts’ course system worked. It became extremely important to always prepare questions to ask and gather as much information as possible. When I got results that seemed somehow surprising, I would always turn to my adviser, Professor Beanland, for help. Sometimes, he would point out a miscalculation that had skewed the data. I learned something new from almost every mistake I made. 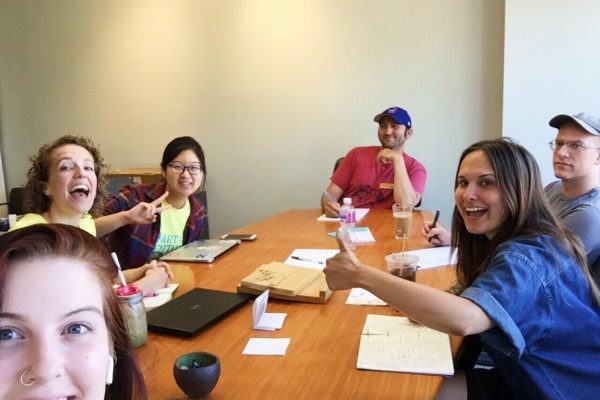 Wang (third from left) in a weekly meeting with the education team at VisArts. Have you met anyone who inspires you? If so, who and why? Almost everyone working here inspires me in a certain way. Rachel Beanland, the deputy director, is always energetic about her work and cheers on the whole team with her passion. Jordan Brown, the director of education and programs, also has a background in painting and printmaking. She never gave up on her love of art. People here are brought together by passion and love, and they inspire me with their devotion to art as well as the whole community. Did you get to take any art classes yourself? Yes! I took a frame weaving class. This is my first time taking a fiber class and it was so much fun. 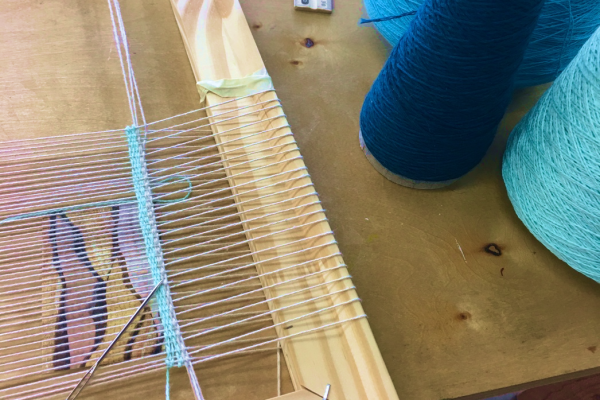 A shot from Wang’s frame-weaving class at VisArts. How do you think this experience will improve your overall education at W&L? This experience encourages me to explore a more diverse range of courses and take full advantage of the liberal arts education at W&L. Without this experience, I wouldn’t have known how much fun it can be to do math at an arts center. Without taking the frame weaving class at VisArts, I would not have discovered something I like as much as photography. I’m learning to step out of my comfort zone and embrace the well-rounded education W&L offers to its students.